It is one thing to understand how to consistently hook salmon on the fly when the opportunity arises but it's a completely different dimension understanding the value of the correct mindset to get to that exciting moment of the fishing day. The following paragraphs will give you a few of my thoughts on this which I'm 'absolutely' convinced are highly accurate. I read a book once about the Indian tribes of North America who use to follow and live off the huge herds of buffalo that roamed the nation. These Indians who were totally dependent on hunting success for their tribe's existence would never start to hunt thinking about making 'the kill' as they were convinced it would mean no success. These astute Indian hunters were completely convinced that if their minds where in that 'must kill' mode that the beasts they were hunting would pick up the signal and disappear away from danger. Sounds impossible on the face of things I know but I can 100% relate this to Scottish salmon fishing after decades of watchful & observant riverlife. As a ghillie if I ever hear the words from a salmon fishing guests 'come on fish' I completely cringe and know beyond doubt that we are heading for a blank day. If an Indian's spear was ever acting as a transmitter to forewarn a buffalo of imminent danger then what on earth is a 15ft carbon fibre antenna going to do! Do not ever use those words while fishing for salmon if you want success. A big part of fine tuning your salmon fishing approach is knowing how to stay under the radar and blend into the surrounding environment. Don't think for one minute an Atlantic salmon is not an absolute survival specialist because its amazing journey to and from its oceanic feeding grounds should be all the proof you need to tell you otherwise. Part of understanding advanced salmon fishing fine tuning like this is taught via my carefully selected professional salmon guide team who all have this level of insight into Atlantic salmon and the often finely tuned river approaches that bring about fishing success. Follow this link to book a day for yourself in the hands of an expert or treat a loved one to these seldom discussed insights via a guided salmon fishing gift for Christmas. 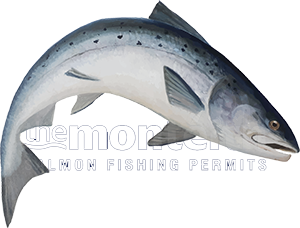 There's much more to being successful at Scottish salmon fishing than just buying a permit and a fishing rod as without the proper investment in 'salmon fishing knowledge' the above two components will only provide a day beside a river with little chance of a fish. In all other walks of life knowledge and training are crucial for success as is the case in Scottish salmon fishing.